In addition to accepting cash, checks, and all major credit cards, our dental office offers monthly payment plans through an outside health care financing partner like CareCredit or Chase Health advance. These payment plans can be used to cover the expense of dental services and other health care needs. 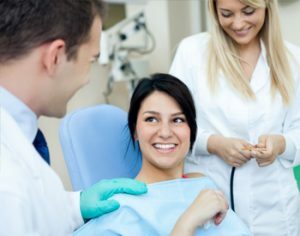 After you and your dentist have agreed on your treatment plan, you simply complete a brief credit application, which is submitted to the financing partner, either by phone or online. You can also apply online from the convenience of your home. If you need assistance with your application, please feel free to call our dental office and we will be happy to help you. There is no need to wait for days to receive affordable dentistry, as a credit decision typically is made within minutes. Your treatment can begin at once, usually with little or no money down. You pay for the care you need over time, in low monthly payments. Some plans offer a revolving line of credit that you and your family can use for ongoing dental needs — a convenient financial resource for preventive, emergency, cosmetic treatment, and even braces /orthodontic treatment. Contact us today to learn more about the insurance plans we accept and our financing options!